How do buildings affect people emotionally? Most architects prefer to talk of atmosphere rather than emotion. For architectural theorist Mark Wigley, atmosphere: “surrounds a building, clinging to the material object.” He says it even emanates from the building: “It is some kind of sensuous emission of sound, light, heat, smell, and moisture; a swirling climate of intangible effects generated by a stationary object.” So the architect seeks to create atmospheres, with the building as a means to that end: “In the end, it is the climate of ephemeral effects that envelops the inhabitant, not the building” (p.18). In a way, architecture inherits its capacity to provide this atmosphere second hand. It’s nature that offers the real emotional connection, and architecture connects to the emotions via natural materials. Buildings create atmosphere in so far as they draw on nature. Walter Benjamin also indicated the close coupling between nature and atmosphere, though he called it aura: “If, while resting on a summer afternoon, you follow with your eyes a mountain range on the horizon or a branch which casts its shadow over you, you experience the aura of those mountains, of that branch” (p.4). For Benjamin modern society’s economically-driven desire to dissect and scrutinise nature in minute detail, and the incessant mechanical reproduction of natural objects through the mass media, destroys the aura of an object. 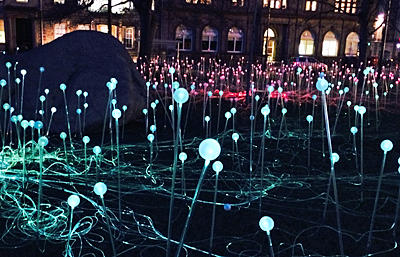 Field of Light by Bruce Munro in St Andrew Square, Edinburgh. It is made up of 9,000 lighted glass orbs that change colour. The Greek word from which aura derives means breath, and the word aural pertains to the ear (via Latin) and to sound. So an aura’s visual presence is all but eclipsed by other sensory modes, the constituents of ephemeral atmospheres: subtle scents, a gentle current of air. This is another aspect of aural discourse. Contact with natural environments (particularly the ground) allows us to “equilibrate with the electrical potential of the Earth” (p.2). It’s about health, but also the removal of anxiety, depression and irritability, i.e. negative mood states. I’m currently trying to exhaust all the proposed physical, measurable and putative causal relationships between mood and environment, no matter how plausible or otherwise: the phases of the moon, morphic fields, ley lines, the placebo effect, confirmation bias, and meditation on nature. So now I can add electronic equilibrium to the list. Whatever the evidence, these theories constitute fascinating cultural artefacts (memes perhaps) that feature in the way people interpret the complex relationships between emotion and place. I’m grateful to Charles Pardo for pointing out the to me the article on grounding. Also see article on Zumthor in de Zeen magazine. According to some of the papers cited by Chevalier et al, the cure for an imbalance of electrical charge in the human body is to walk around barefoot, or at least to to avoid synthetic rubber shoes. You can also sleep on a special mattress grounded to the earth through pipes in your home, in the same way that electrical sockets are earthed. 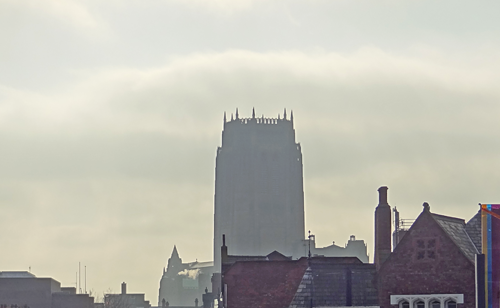 Also see posts on soft fascination, urban brain, and the orgone accumulator. Chevalier, Gaétan, Stephen T. Sinatra, James L. Oschman, Karol Sokal, and Pawel Sokal. 2012. Earthing: Health implications of reconnecting the human body to the earth’s surface electrons. Journal of Environmental and Public Health doi: 10.1155/2012/291541, 1-23. Spier, Steven. 2001. Place, authorship and the concrete: Three conversations with Peter Zumthor. Architectural Research Quarterly, (5) 1, 15-36.